There are multiple voices raising concern about President Trump not taking immediate Executive Action to reverse former President Obama’s DACA (Deferred Action for Childhood Arrivals) program. To those voices this message is intended. Now is not the time to address DACA. The UniParty and the UniParty friendly media are trying to bait President Trump into jumping into a politically charged issue they will use to slow, if not destroy, the larger agenda. There are two Obama executive action constructs, DACA and DAPA. ♦ Deferred Action for Childhood Arrivals (DACA), also known as “The Dreamers” executive order which has been implemented and carried out deferring immigration enforcement for the children of illegal aliens. ♦ Deferred Action for Parents of Americans (DAPA), was the executive action found unconstitutional by Judge Hanen (Texas), blocked by injunction, and subsequently the injunction was argued through the appellate court all the way to SCOTUS – and upheld. The Department of Homeland Security reluctantly halted DAPA implementation after they were defeated in the court system. However, DACA, the deferred action for “dreamers” has been ongoing. It is the DACA program that contains the largest political issue. Trump supporters want to see the DACA executive order overturned, and it is not my intention to dispute the argument it should be because I too agree it should be overturned. However, now is not the time…. Former President Obama was asked, repeatedly, what would draw him back into the political equation to become an activist against the Trump policy and agenda implementation. At each response he continually cited DACA as the key issue which would bring him back to DC in opposition. Not Obamacare being repealed, but DACA. Nothing would unite the various far-left activist groups more quickly than for President Trump to immediately reverse the DACA executive order. This is where prudent thought needs to be applied, and as annoying as it is – politics need to be considered. Nothing would please Chuck Schumer and Nancy Pelosi more than to have the issues around the immigration gang-of-eight bill hijack the current approach of the Trump agenda. Schumer, Pelosi and crew would enjoy nothing more than pulling out the racist, nativist, bigot cards and the media would like nothing more than to showcase them. Attorney General Jeff Sessions as a nominee would be bombarded by questions about DACA and beaten up with any political nuance or misstep created by a blood-lusting anti-Trump media, while immigration activist groups were simultaneously engaged by all the coverage therein. Marches would begin immediately. Every talking point by Senator Corey Booker would be front and center. The Democrat machine would be canonizing anyone who rose in opposition to the Trump administration based on DACA concerns. Halos handed out to Booker, Keith Ellison, Tom Perez et al. Do you really want to give the Democrats a tool to unite their fractured clans? Additionally, all of Trump’s GOPe detractors would be empowered to act against him through various constructs of non support. Microphones and cameras would immediately be shoved into the face of Marco Rubio, Jeff Flake, Lindsey Graham, John McCain, Kevin McCarthy and Paul Ryan. Have we forgotten that amnesty, the gang-of-eight bill, was only 48 hours from passage IN THE HOUSE OF REPRESENTATIVES when Eric Cantor was primaried in 2014? Even the current OMB Director nominee Rep Mick “cantalopes” Mulvaney was in support of the Go8 bill. The scope of the political use of DACA as a weaponized narrative to undermine President Trump would be as immediate as CNN, MSNBC, FOX and the alphabets fully engaged, and Wall Street financed, gaslighting. All of it fueled by a useful narrative to destroy the Trump agenda. DHS Secretary nominee Kelly would need patriot missile batteries outside his office and house to stave off the incoming MSM scud missile launches. The 24/7 coverage of President Obama dropping his vacation plans to rush to Washington DC would play out over screens like the white Bronco carrying OJ Simpson, he had planned a great vacation with his family, he even found the Best Cooler to take with him but things didn’t workout at the end. David Brock would be hiring up staffs of hundreds as Hollywood poured millions into Democrat coffers to fuel a narrative and organize the takeover of urban city halls. Mexico would be empowered with “hateful Trump” leverage in any NAFTA discussion. The southern border and protective wall?… would be more fuel in a created narrative of Trump dragging babies out of their crying mothers arms to throw them over the Rio Grande. No, this is not winning. This is the opposite of winning. This is giving your enemy exactly what they need to create a hateful optic and a spin a usefully false narrative to diminish President Trump. This predictable outcome is exactly why the MSM is trying to provoke President Trump and his spokespeople and representatives into the DACA conversation/debate right now. The GOPe wing of the UniParty would also benefit from this. Heck, every oppositional entity within the swamp, who view Trump as a threat to their preferred status-quo, would work on this effort. Think prudently. Remember, cold anger does not act to spite itself. Be politically wise and understand the larger goals. Yes, DACA will be removed – in a logical, methodical, prudent and sequential time frame. Know and understand the enemy. Now is not the time to act on this issue. This entry was posted in 1st Amendment, A New America, AG Jeff Sessions, Agitprop, Big Government, Big Stupid Government, Cultural Marxism, Death By Illegal Alien, Death Threats, Decepticons, Deep State, Dem Hypocrisy, Dept Of Justice, Donald Trump, Economy, Education, Election 2016, Illegal Aliens, Legislation, media bias, Mexico, Occupy Type Moonbats, Operation Brown Dream, Political correctness/cultural marxism, President Trump, Professional Idiots, propaganda, Racism, Tom Perez, Typical Prog Behavior, Uncategorized. Bookmark the permalink. This tangled mess, illegal immigration and all the rest, wasn’t made in a day and it won’t be untangled in a day. I trust DJT’s judgement, timing, and intent. And I DO NOT appreciate all this second guessing and jumping the gun. You people that are jumping on the ‘DJT broke his pledge to end illegal immigration’ bandwagon ALREADY need to take a deep breath, get a life and let him do the job his way, in his time. I’m sure the msm and other swamp rats are REALLY enjoying your bitching. Those of you who are trolls…just go to hell. He has already earned all of our support and trust. I do so implicitly. No, I don’t rubberstamp every thing, but he has done nothing to cause doubt. Not in the least. Rudy, I probably agree with your intended meaning…but your rhetoric makes us all sound JUST LIKE the liberal ranting mobs…..and lashing out on this forum is actually hurtful to the way the positive and fact based dialog helps combat the left and their machinations. And as much as i trust Mr Trump’s judgement, I every bit as much trust the judgements of Sessions, Miller, Bannon, etc. In some ways, this is actually very helpful to Trump. He will know how to play the “outrage he’s not moving fast enough”. LOL. They CAN’T win. I would like for the Trump administration to release via Media or even Twitter outlining by City that are “Sanctuary Cities” exactly what Federal Moneys and Amounts are currently being sent to those cities under any and all Federal Programs….so EVERYONE in those cities could understand WHAT is at risk if their mayors and councilfolk do not obey the Federal Laws on Illegals. There needs to be a plan in place to stop anchor babies. Some Constitutionalists believe that the 14th amendment was not intended for illegals to use it, or for women from China or other parts of the world to fly to the United States, have their baby, and get dual citizenship. Tillis’ “immigration overhaul,” as The Wall Street Journal dubbed it, would serve as a new kind of “Gang of Eight” legislation, promising amnesty to illegal immigrants, which could eventually lead to a pathway to citizenship. While Tillis’ legislation would increase “border security and toughen enforcement of immigration laws,” it would also grant amnesty, a type of immigration reform measure that Democrats have been demanding since the 1990s. Seems to me that Mr. Tillis is going against what the previous NC republican governor and legislature initiated in joining that Texas lawsuit to stop obama’s executive order and they are working at cross purposes. We’re watching you Mr. Tillis and right now I don’t think I like you very much. Whose side are you on anyway? Nevermind, I already know the answer to that – all of congress is definitely not on the side of the people. Not yet anyway. Sic ’em President Trump. I know it’s going to be tough to pass that but wow, would that be awesome if it did pass??? Also, tackling illegal aliens already here before the border is secured doesn’t make much sense. It’s kind of like bailing water out of a boat with a hole in it – fix the hole first otherwise you will be bailing out a whole lot more water. I agree. And we need to “prime the pump” with some horrible illegal murderers, drunk-driver child killers, Obama-protected rapists, and all the rest. Also the FIRING – most visibly – of Obama slackers in DHS and Border Patrol. We need to know their NAMES as they go down in a blaze of infamy. Come, come, people. The show will go on. The warm-up acts need their time in the spotlight, too! I read today that data from years ago – about 2007 – showed that 12 Americans a day are murdered by illegals and 13 killed in DUIs (by illegals). Imagine what the numbers must be by now. That doesn’t include rapes. Breitbart published an article some months ago which said that 70,000 women had bee raped by illegals. I do not know the time frame on that number. We seldom hear any of these stories. The real numbers do need to get out to the public. That could have quite an impact on public perception. There must be a very interesting information war going on right now. I know which side has the shredders in their artillery, however. And which one doesn’t. Interior enforcement can be done simultaneously with sealing border…..you know, like walking and chewing gum at the same time. It’s not either/or. How do you fix a hole when you’re already out in the water? Too late. Bailing is the only thing left. 1) Illegals engaging in criminal activity are kicked out of the country. 2) Sanctuary cities go broke for lack of Federal support. 3) Employers are required, under severe penalties, to use e-verify. 4) Money remittances to foreign countries by illegal aliens are taxed or confiscated. 5) The Southern border wall is erected. And watch many more packing and leaving with their mooching families. Then, it’ll be the time to discuss how to go about of those remaining here. That’s the cherry-picking, no-sweat, take-your-time method. The bonus is that, with each measure, the government gets stronger backing for the American people. Very nice summary, if I may? Indeed. I have the feeling that your #6 will occur before my #1. I didn’t see them in any particular order… and it was SD who mentioned SCOTUS… upthread… It’s all good, no it’s all grrrrrrrrrrrrrrreat! And all those things are attacking DACA immediatly, for sure. Death by a thousand cuts. Let the final act of putting DACA out of its misery be a mercy, after Trump turns renewed enforcement against villains into the ultimate circus of evil and showcase of Obama negligence. Let Obama HIDE HIS FACE when he comes out of his prison in Washington to go to the store. 3. Employers who are currently breaking immigration laws, are charged, prosecuted, convicted, fined, and/or jailed. And who knows, maybe the fines could pay for 1/2 of the wall! Enforce all federal laws against providing illegal aliens with federal entitlements. In New York City a person applying for Medicaid merely states he/she is a citizen. NYC does not require documentation. I agree. By starting with your number 1, which he is already laying the groundwork for in statements today, he builds support for the broader actions necessary to deal with DACA which is much more politically sensitive and needs to be approached in a way that builds a logical case for making it happen. That approach makes much more sense than rushing headlong into a political trap like that idiot Mark Levin was advocating on Monday or Tuesday, when he was whining about Trump not dealing with DACA on Day 1. I used to think that Levin was a smart guy and he may well be, but his judgement is definitely clouded by his hatred of Trump. I’ve totally written him off. Trump knows he can afford few defections in the upcoming confirmations. Get them confirmed! Then tackle DACA. He hasn’t forgotten us. AMEN. He is really nipping this one in the bud. AND he’s warming up the crowd for the show. 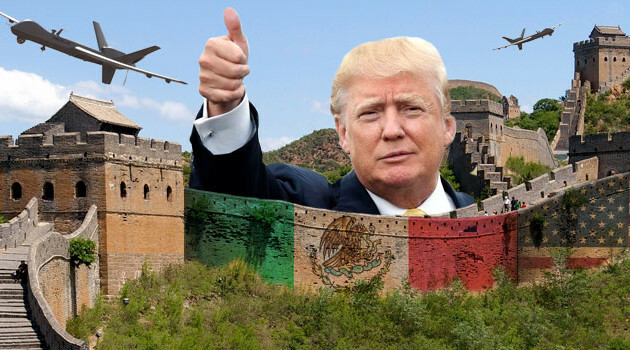 I’m so excited about The Wall, and am hoping there will be a volunteer program to let people take a vacation to work on it! Seriously, I was wondering about volunteers myself. /\5. My concern is the mid-terms and voter fraud by illegal aliens. They could put more Dems in both houses and we could lose our majority. They are scheming as we type! They certainly are. I’m keeping my eyes open locally. If Obama goes out campaigning for them, I hope it turns out as badly as in the past. Keeping watch is not sufficient, and we need to work to get elected to local and state positions, vet judges who run, and make sure we have good sources of information like this website to give people who are not informed on current events. We need Voter Laws that Require proof of being U.S. Citizen. Preferably government issued photo ID that is clearly marked as U.S. Citizen -or- NOT. Wouldn’t it be divine if President Trump has Chris Kobach working on something to prove the illegal voting claim that he’s keeping in the spotlight. Then we might get our voting system corrected before 2018. He just HAS to be using Kobach for something – he’s done good stuff. There is answer to ABSOLUTE Deadline for having Deported ALL Illegals and Anchor Brats (which are now old enough to vote). That’s been my thinking, too. We need to have these deportations done by mid terms! Or, at the very least, have a process in place that will stop voter fraud by illegals. They say there is no PROOF of voter FRAUD but what about their recount which found way over 100% voters in many DemoncRATIC controlled cities, Oh and where is the PROOF that the RUSSKIES hacked the ELECTION process. The GOP has nothing to worry about regarding the Senate in 2018. It’s the Democrats who are in a terrible position. I would say that ending DACA needs to be a first 100 days thing. It is a symbol of Obama’s refusal to enforce our immigration laws. He doesn’t need to do mass deportations of DACA beneficiaries, but he needs to stop issuing new work permits, and let existing ones expire. I disagree. We have other priorities that are more important. Democrats are also looking for reasons to impeach. Camulla, that is insane….what does reversing DACA have to do with impeachment? These ignorant trolling comments are below CTH standards. 100 days is long enough, more than reasonable, and provides ample time for strategy. 100 days would be really stretching promise of Immediate action on DACA. The difficulty is that WHATEVER President Trump does, the Leftwingers will go ballistic on it. Backing down never wins you any brownie points when you’re facing killers. Also, it’s generally thought that big changes need to be pushed through in the first 100 days (see FDR, first term, for the precedent). The opposition doesn’t need time to get dug in. Did you skip reading the article? Well said. So tired of all the clueless nervous Nellies not trusting Trump. Sundance has a point. I understand we all excited about doing everything asap. However, there are opposition within gop and trump needs to get things done using them. I think securing border with a wall and other personnel reinforcement is the first step. We need to dtop flow of illegals and start kicking out. Although kicking of crminals should start immediately. Remember trump will use this daca thing as megotiating card against mexico on mo of issues. On a relevent topic. I suspect many of daca and others may have voted for hillary in blue states. Media is now hurting trump with this clsim and demanding proof. Poor lindsey from my state is against trump. Can sundance and even veritas should do onvestigation on illegsl voters. AG sessions can look into this too. This can destroy dems in CA like places. Rome wasn’t built in a day. Give Trump and his team space. They are making me smile every day. It’s a cut-and-paste from a number of original pictures, but I don’t know the origin of any of them. The POS Senators will not confirm anymore nominees this week…Senator Sessions is a SITTING SENATOR you rat ba*tards! I called Senator Toomey’s office and left an UGLY MESSAGE for them to get off their “fat asses” and start earning their 6-figure salaries for they are nothing but Traitors! Call back and Demand to know “WHY” they have decided to put off confirmations. I have been so sick for so long about the way things have gone under Bush and Obama that I find it almost impossible to think politically/pragmatically. This is my bastion of sanity and Sundance is the monk of the four winds. Breitbart.com, had this dual nature during the general election. While it clearly, supported President Trump, it would also publish (and commission) Polls of DOOM! And of course, regarding this issue, ACE promptly picks up the ball and runs with it. Its only been 5 days, there’s not even a full Cabinet confirmed yet. Its very simple, has President Trump so far done anything that indicates he’s going to sell out on his prime issue? No. If anything he’s doubled down and hysterics have ensued by those opposed to him. Trump has accommodated the RINO traitors so far, with his cabinet picks and with his agenda (Obamacare, regulations and Keystone). Notice the populists got the shaft where cabinet picks and policy were concerned, and it pisses me off remembering how he promised to propose a law for “dear, sweet Kate Steinle” on DAY ONE, and didn’t! What is the point of confirming Sessions, if the GOP signals they won’t fight for their base? Why do you pussies always cave to the left, even when you control the government?!! One problem is that a clever ‘don’t provoke lib MSM right now’ strategy is indistinguishable from Priebus/Ryan sellout. I tend to agree with sundance but news reports are coming out this afternoon about how the trump base is angered no action has been taken. Lucienne.com is reporting that immigration exec orders will be signed this week. Will be interesting to see what they say. Please stop with the Trumps base is angry nonsense. This is a basic CIA technique to weaken a populist leader who depends on the people’s support to enact reforms. It’s called sowing poison pills of doubt among the leaders base that he will betray them. Hello. Trump was sworn in on Friday. Today is Tuesday. What he’s accomplished is amazing and he only has 3 of his cabinet approved. Any source saying the base is angry represents the enemy. The letter describes TRUMP as havng “…a sort of powerful liminosity, a unique high vibration integrity…sheer presence…a Lightworker…its not even all about TRUMP. per se…there is a vast energy swirling around that’s been held back by the armies of obama/blm darkness, and this energy has found a conduit, a lightning rod, and is now self-organizing around TRUMP…” and so forth. I tend to agree with much of what this leter writer had to say…I loved the “sort of powerful luminosity” thing. We can all rejoice, indeed, that this man has arrived in our time, as the Bible says of Queen Esther: for such a time as this. President Trump is expected to sign multiple executive actions on Wednesday that would tighten U.S. immigration policies, according to a report Tuesday. The signings are set to take place at the Department of Homeland Security. The orders are likely to include restricting immigration from countries where the Islamic State has strongholds, including Iraq, Iran, Libya, Somalia, Sudan, Syria and Yemen, Reuters reported. Mark Levin just chewed up Trump on this issue for not already taking action. I no longer have any use for Mark Levin or anything he has to say. I do not wish him well. I do not wish his family well. I don’t worry about his pets either. He can drop dead at any moment and I wouldn’t miss a beat. He’s a snake. and an irritaing snake, at that. Turn him off. He’s a complete a$$hole. Just a reminder to those that wish to show mercy to the illegals. Never forget! Trump’s orders were expected to involve restricting access to the United States for refugees and some visa holders from Iraq, Iran, Libya, Somalia, Sudan, Syria and Yemen, said the aides and experts, who asked not to be identified. And to whom does the Constitution apply? Foreigners attempting to enter the country? I don’t think so. The law is clear here. The President can stop anyone he deems from entering the country. There is no religious or race cause at all. But he won’t ban a religion, just people from certain countries. If Trump did this the other way around (i.e. try deport dreamers before he has the apparatus in place to prevent future dreamers), then he will lose the political support he needs to get the restrictions on future unvetted immigration in place. To go with the old trite “flooding boat” analogy, my preferred outcome is both plug the holes and bail out the water that’s in it. Plugging the holes is the absolute first priority. If getting into a swamp of arguing over who does and doesn’t deserve to get bailed is going to torpedo support for plugging the holes, then it is stupid is all hell to have that argument BEFORE the holes are plugged. Doing it Trump’s way, worst case scenario is the holes get plugged, but not enough bailing to suit me gets done. Doing it the other way around opens up risk that you get NEITHER holes plugged nor bailing done. If the Reuters article above is correct, it looks like Trump is doing threat assessment. Terrorists are the #1 threat. Then probably the drug smugglers and violent criminal illegals. DACA recipients are low threat. I came across this case scheduled for this month. A day after Justice Hanen’s ruling halting alien work permits, in 2015, a dreamer in NY receives his work permit. This Dreamer believes Texas ruling should have no bearing on him, a NY residence, also a sanctuary city, and filed suit. He doesn’t have a case. He received his three-year work permit from the government in February 2015 — one day after Judge Hanen issued his injunction. The permit he received was invalid. Too bad for him. By the way, I think that article did not accurately distinguish between regular DACA and expanded DACA. I think it’s more than just an extension of time from 2 years to 3. I think some of the people who were eligible for expanded DACA were not eligible for regular DACA, otherwise Senor Vidal could have simply attained a regular DACA deferral, correct? Receive a letter and/or notice from USCIS to inform you of the action you must take. . If you received a 3-year DACA work permit after Feb. 16, 2015, you can use our online tool to verify whether you must return your card. It is important that before you return your 3-year card, you first use this online tool to verify whether you are in the group of recipients required to return a 3-year EAD. Additionally, you can visit Case Status online to verify whether USCIS has received your returned 3-year work permit or certification. The reason for this action is that, after a court order in Texas v. United States, No. B-14-254 (S.D. Tex.) was issued, USCIS approves DACA deferred action requests and related employment authorization applications only for 2-year periods. USCIS has sent new valid, 2-year work permits to all affected DACA recipients and rendered the 3-year work permits invalid. Pay special attention to that last line. Did Senor Vidal receive a 2-year permit? So what damages did he suffer? USCIS has accounted for over 99 percent of the approximately 2,600 identified invalid EADs requiring return. Twenty-two of the approximately 2,600 recipients failed to return their EADs or certify good cause for not doing so by the deadline of July 30, 2015. As a result, those 22 have been terminated from DACA. Was Senor Vidal one of the illegals who didn’t return is card in time? That’s his problem. Failure to comply with the rules. Too bad. Another case, another sanctuary city, Illinois. I think, the extended DACA program is the provision to the expanded additional year to work permit, and also provided DAPA for US born alien child (the original DACA US born, 2 yr work permit?). Still reading. Sorry man, but this is cuck talk. Trump won the election. He is the President, and issuing executive orders is his power, NOT Congress’s. The RINOs in Congress have zero say in it, and they shouldn’t have any say. If RINOs want an opposite policy, let them try to pass a bill to codify DACA. Just let them try it. They will fail spectacularly, and the American public will be quick to point out how Republicans opposed DACA back in the day because it was an “unconstitutional use of executive power” – they called it “tyranny.” They will get slaughtered. Trump will be overrun if he goes soft and gives in on a key campaign promise. It will be perceived as weakness and invite more and bolder attacks. He should cancel DACA and DAPA and hold some other agenda item of Republicans hostage if they open their mouths after he does so. He is an expert at controlling the media cycle. Looking at, reviewing, pending illegal immigration DACA cases is not “cuck talk”. It is the SUBJECT of this thread. Thx for your feedback, WM. This why I got on the Trump Train. I am NOT a Paul Ryan conservative. Paul Ryan is the enemy. I stand with Jamiel Shaw, Ms Moreno, Brenda Sparks,Sabina Durdin, and countless other victims of Paul Ryan. I pray Trump does not delay action on DACA not another American should have to to not offend Paul Ryan or the media. Love the Thank You photo, the lady giving America the fingers. So much gratitude and class, how did America get along with out her all these centuries. Simple principle. Make sure the boat isn’t taking on more water before you start to bail, or you could end up sinking. Verify jobs only go to those eligible to work. whoever is STILL here, deal with them. DACA can be stopped at any time, the DACA status is not permanent. They will expire in a few years. This is sound reasoning, but remember no matter when Trump decides to rescind DACA the left will unite and fight. It seems Sundance is arguing that they can be lulled to sleep and it doesn’t work that way. The evil left never sleeps and will get wind of it anyway, so Trump should prepare to rescind DACA shortly after Sessions is confirmed. It’s blatantly unconstitutional after all, so it should take some priority. I was saying about the same thing yesterday on some other sites PDJT is removing the criminal element building the wall & stopping sanctuary cities the amount the DACA applicants in total are not that high I think total for last year was 287,000 when your looking at illegal immigration as a whole. The criminal applicantsa are not approved. He has to throw a bone out & I thought myself this was smart to do FOR NOW. I hope down the road it changes actually I hope down the road we stop the allowing anchor baby’s ending it. I had to snicker when I read this. Trump buzzes thru 16 opponents and the Democrat nominee who was supposed to be a shoe-in and we’re supposed to be worried about Schumer, Perez, or (Gasp) Obama? The media might give him “hateful optics”? Pulease. Like they are giving him glowing adulation right now. The GOPe might need to be closer to an election, that’s true. That seems to get their minds right. My sense is Trump needs to ‘feel’ the time is right. The idea that he is worried about any congresscritter or even The One™ Himself is an area of concern Trump does not even bother to contemplate. If Obama opened his trap Trump would lower the boom on him what with all the spying shenanigans. Maybe he will surprise us on Cinco de Mayo. But for now, I think the better argument is “Let Trump be Trump”.